I’ve had little blenders before and always had trouble getting the ingredients in the bowl to mix properly. Not so with this little gem. It quite happily chops and mixes dry amd wet ingredients with no need to take the lid off and scrape down. I’ve had it for about 5 years now, so this is a late review. Ok, if you immerse the top lid in water, it does get water in it (and it takes ages to shake it all out), but you just have to remember to give it a good wipe over instead of plunging it in water. It makes amazing mayonnaise and the lids that come with the small and tall bowls are really useful for keeping things fresh. Every kitchen needs an immersion blender to blend up small amounts of puree, mix things in pans and general do stuff where the fuss and clean-up of a large free standing blender/food processor isn’t worth the hassle. There are loads of them on the market, and most of them do a pretty similar job. 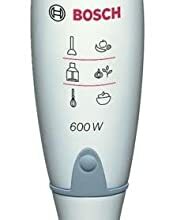 I guess if there are any disinguishing features that make one immersion/hand blender stand out above another, its down to a few characteristics- robustness – does the mixer attachment attach firmly and securely with no risk of the drive shaft breaking or stripping; will it take the knocks and bangs that will happen in a kitchen- blade/blade housing design – does it quickly pull up food to puree/liquidise whats in your bowl or pan, without splashing liquidised food all around (i’ve had some very messy accidents with poorly handled, poorly designed immersion blenders. – speed – generally, a bigger motor is better, to give you the power to blast through your food; variable speed control isn’t needed, just one or two speeds and an easy pulse switch is fine, but its a great thing to have when you’ve got itergonomics – is it well balanced in your hand, leaving the other hand free to hold the bowl/pan with your food in it?the bosch comes out great on all these tests:- its made out of robust very thick plastic, clicks together very nicely and feels like it will take a beating. – it blasts through food with rather less splashes than i expected – the design of the blade and blade housing seems to be good at pulling food up into the blade to chop, but without spraying it out all over the place. – the motor is a pretty hefty one, not the biggest, but easily big enough and feels quite capable of pulverising most of what you throw at it. – variable speed is great when working with more difficult food. – it sits brilliantly in the hand and – overall – feels a very tight and well put together piece of kitthe accessories it comes with – the bowl/beaker and herb cutter are pretty superfluous – i’d rather have had a whisk attachment with it, if i’d had the choice, rather than having to look to buy one separately. And the included wall brake seems daft (and slightly flimsy for what it is). The blender sits quite happily on its end in a corner. Love this – my favourite kitchen appliance. Only problem is lid design means i cant submerge it to clean so have to wash it by hand carefully – otherwise though, great little blender. pros- powerful- handy mixing beaker with lid for storage- mostly easy to clean- value for moneycons- chopper lid not so easy to clean- bottom of mini chopper flimsyi’ve used this for over 2 years now to blend many things such as onions, carrots, garlic and whole spices using the mini chopper. I’ve also made a banana milkshake and hummus from scratch. The mixing beaker comes in very handy for storing any leftover mixes as it has a lid so i pretty much use it every day. I’ve used the blender foot to blitz up potatoes (chopped half & then in quarters), peppers and even lentils and it does a good job. It shows a whisk symbol on the motor but it didn’t come with one. Cleaning is easy apart from the chopper lid. After washing the chopper lid i realised water had seeped in from the centre and there’s no easy way to get it out other than shaking it vigorously. After that incident i now use a damp sponge to scrub with a bit of liquid to get rid of any smells and then wipe with cloth, other than that the rest of the bits go in washing bowl. Also the bottom of the mini chopper can be quite flimsy a few minor drops can snap a piece of plastic off, however i’m not fussed about it doesn’t affect the overall performance. Until now i’ve used a food blender/mixer to make soups. I bought this to save on washing up. I find that it blends soup to a lovely texture. The button is difficult to use with a thumb, but i think that it is designed to be used with the fingers, as it’s better to hold that way. My only gripe is that you have keep the button held for it to work, i would have preferred it to stay on once i pressed it and another press would stop it. Apart from that i am very pleased with it, hence 5/5. 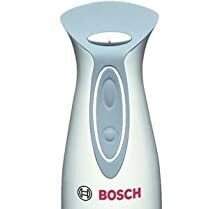 I buy bosch because they have been outstandingly reliable (i still have a bosch drill that is now 18 years old and still working perfectly) and certainly worth the money spent. 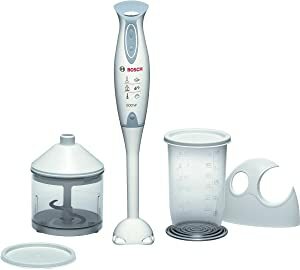 Product Description, Bosch MSM6300GB Hand Blender and Accessories, 600 W – White/Grey. Excellent handling through soft touch handle and ergonomic shaping. High quality heat resistant blender foot with eject mechanism for easy detaching of foot. Heat resistant plastic foot with stainless steel blades for blending a variety of foods. Annoying splashes when preparing dishes are a thing of the past thanks to anti-splash mixer foot with optimised design. So all your work is easy, convenient and above all clean. Ergonomic design combined with special shaping of the handle with grippy soft-touch coating enhances comfort while providing a secure grip. An additional turbo button provides maximum power at the touch of a button so you can implement your ideas quickly and easily and achieve optimal results every time. Powerful with low noise and low vibrations. The 600 watt motor makes short work of anything you want to mix and crush and it’s highly convenient.